Foam brushes are designed for cleaning lab glass and plasticware. Brushes are made of a special foam that does not get wet, yet transports water and detergent to the glass surface. 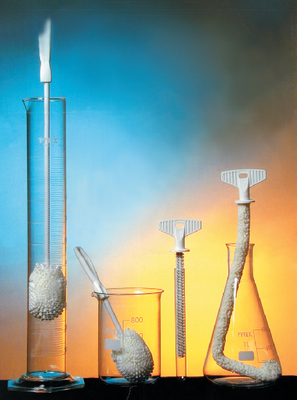 The test tube brush is adjustable to accommodate various tube diameters. Handles are plastic, including grips. These brushes will easily out-live others. They should be a fixture in your prep room.